Up until recently I used to say that I would never be caught wearing cycling shorts. I didn’t see the need. Then came a 50 mile ride on Missouri’s KATY Trail last year. A good friend of mine told me that I’d me miserable without the padding the chamois in a pair of cycling shorts would provide, so I bought a cheap pair and wore them for that ride. They probably helped out on the 50 miler, but I didn’t like the way they, um, fit and haven’t worn them since. Father’s Day, my wife bought me a pair of Nema Jewel shorts. Since I’ve opted to take a 20 mile route to work in the morning in place of the direct 3.5 mile route, I was eager to try them out. Okay, I admit it, I Love them. For any ride over 10 miles, this is the way to go. 9 panel Rip-Stop Nylon outer short. Two dual layer cargo pockets. Liner short with M3 chamois. … and the chamois provides some really nice padding. An unexpected benefit was discovered last week when I rode through some sprinklers; the outer short did an excellent job of keeping the cell phone in the cargo pocket dry. The water evaporated quickly as well … it never soaked in. As of this post the shorts run $59.99 US. I have no hesitations in recommending them. Kinda nice that they don’t look much like bicycle shorts (for which I, too, have an aversion). I got into the whole padded shorts thing, and then quit after seeing so many people without them. I ride 20-30 miles some day in regular shorts, and it does not seem to hurt any more than the bike shorts (which hurt in different ways) The biggest problem with the bike shorts for me now is they cause me to go numb in places that should never ever go numb. Do you not have any transition problems with these? The only time I would want them is if I was riding more than 25 miles without stopping. But then lately I like to stop and rest every hour or so. I find it recharges me better. Warren, just wondering how long that 20 mile commute takes you. Shorts look nice by the way. They’re a New Zealand company, but they make shorts that I think might suit you if you don’t like to have a full chamois when commuting. I love ‘proper’ cycling shorts, both road and MTB types. But for commuting I prefer something more casual that I can ware either ‘commando’ or with underwear depending on the weather. But I agree with Ringer, definitely don’t look the cycling shorts part. Tom, it takes one hour and twenty five minutes on average. It is a gorgeous ride of a half mile of light traffic and 19.5 miles of bike/hike path winding through the woods and next to several small lakes. I can’t tell you how much I enjoy it. Adriel, I haven’t had any numbness problems with these. I’m not quite sure what you meant about transition problems but my typical routine when I hit the office is to get the laptop up and running, get coffee and answer a few e-mail messages … taking about 15 minutes to get cooled down before I head to the rest room to get cleaned up and changed. The nice thing about these shorts is that they don’t look like typical bike shorts (although the spandex shorts are there under the ultra light shell). transition between normal clothes and the bike clothes. i.e. you get used to the normal clothes and can bike for 20 miles with them, then you try the chamois clothes and your body is used to sitting a different way, so you have to readjust. Can you remove the (inner-spandex short/chamois) from the shell? 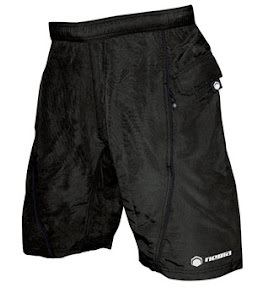 Specialized has a nice pair of shorts that has a removable chamois liner. The Specialized are nice, but almost 2x as much! Thanks for the review Warren. You forgot one BIG problem about NEMA shorts, they do run about two sizes smaller then NORMAL sizes. I mean NOT all of us are built like Tour-se France waifs. So it wasn’t just me? I took the L back and got an XL… Whew. Robert — I don’t believe they come apart. They’re down the laundry shoot at the moment. Adriel, I only get to wear bike shorts 50% of the time I ride due to laundry laziness. The days I’m in street clothes, five miles in feels like 20 miles with the bike shorts. Hey Warren. Third bullet down on the description states removeable liner. I own the shorts and the liner comes out. This is a really nice feature for short commutes or just want to wear them as normal shorts. My version is a little different with the draw straps on the the sides.